Before you plan your visit to the borough, see our complete list of places to go kayaking in Staten Island. Explore a variety of fun sights while kayaking on Staten Island. Enjoy an afternoon on the borough's lovely waters with Staten Island kayaking. Free Kayaking on Staten Island! 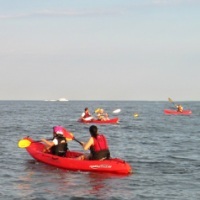 Kayak Staten Island is an all-volunteer organization that provides free kayaking to the public at the shoreline on Staten Island's South Beach. During the free kayaking sessions, everyone is provided with use of sit-on-top kayaks, life-jackets, and paddles; along with paddling tips and launch/land assistance. If you require further assistance, experienced kayakers will be on the water to ensure your safety. The kayaking rides are limited to 15 minutes and provided on a first-come, first-serve basis. Children under the age of 18 must be accompanied by a parent or adult guardian. If you're an experienced kayaker, volunteers are always needed to sign in participants and launch boats. The e-mail address is provided on the website.